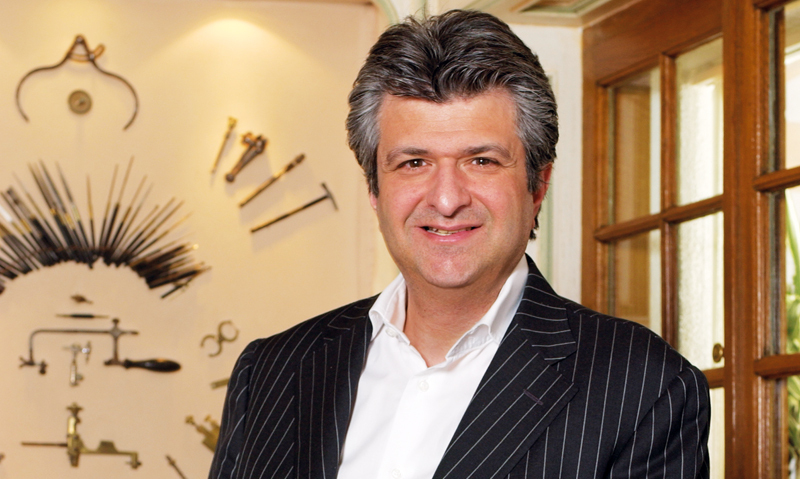 It is impossible to examine the rise of Franck Muller Watchland as one of the most technically creative, fully integrated and totally verticalized manufactures in Swiss watchmaking without tapping into the brilliant mind of the brand’s co-founder, Vartan Sirmakes. Sirmakes got his start with a case-manufacturing company in Plan-les-Ouates, Geneva over 20 years ago. His clients included Daniel Roth, who sought his expertise in the creation of the notoriously challenging Ellipsocurvex cases, as well as Patek Philippe, which requested his help in the fabrication of the cases for its legendary Calibre 89. From the onset of the brand, Sirmakes realized that his future success lay in reinvesting capital into in-house manufacturing so as to control quality at all areas of operation and to enable Watchland to enjoy the greatest rapidity in prototyping as well. As a result, for over two decades, Franck Muller has been a pioneer in the creation of innovative complications, evinced by exceptional timepieces such as the world’s most famous triple-time-zone watch, the Master Banker; the Crazy Hours, the world’s first emotional interpretation of time; and the world’s most complicated timepiece, the amazing Aeternitas Mega 4. In every instance, Sirmakes attributes his brand’s success to the integration between casemaking, dialmaking and, of course, movement-making disciplines, all of which needed to come together to realize his vision for a manufacture that’s second to none in the watch industry. What is the advantage of a fully integrated in-house manufacture? To make watches you need three things. First, it is very important to be able to create the most ambitious and complicated movements totally in-house. Second, you must master the body of the watch, the case. Third, it is important to have in-house mastery over dials. Why? Because the dial is the first thing that catches your eye. A watch dial can comprise 60 percent of the emotional component of a watch. For many years, the watch industry used a supply chain that was a combination of suppliers, but to me, this could not work. It is simple. First of all, to be truly creative, you need to have the person designing the movement be able to talk to the person designing the dial or the person designing the case. Second, in terms of quality, you, as the brand with its name on the dial, must take the responsibility to ensure that every component of the watch lives up to your reputation. Look at the Franck Muller dials, for example. The dials on our Cintrée Curvex models are highly complex. They must be curved to follow the shape of the case, but they must have the best guilloché, printing quality and precision because so many of our watches have complex retrograde indicators. We can only have the assurance of the quality we want by owning our own dialmaking workshop. Similarly, if you are not happy with the crown someone else makes for you, it will take them many months to make you another one. Finally, if you are a brand that is highly innovative like Franck Muller, then you must have the ability for rapid prototyping. And thus you must have dialmaking, casemaking and movement-making as in-house disciplines, because no supplier is going to interrupt his production cycle to make you a prototype case or dial. It is similar to any great fashion designer, like Roberto Cavalli or Armani. He needs to be able to have rapid reaction as part of his creative process. To have what I call “reaction in creation”, it is fundamental to have all the watchmaking processes in your own hands. This is the only way you can make a fully integrated product. 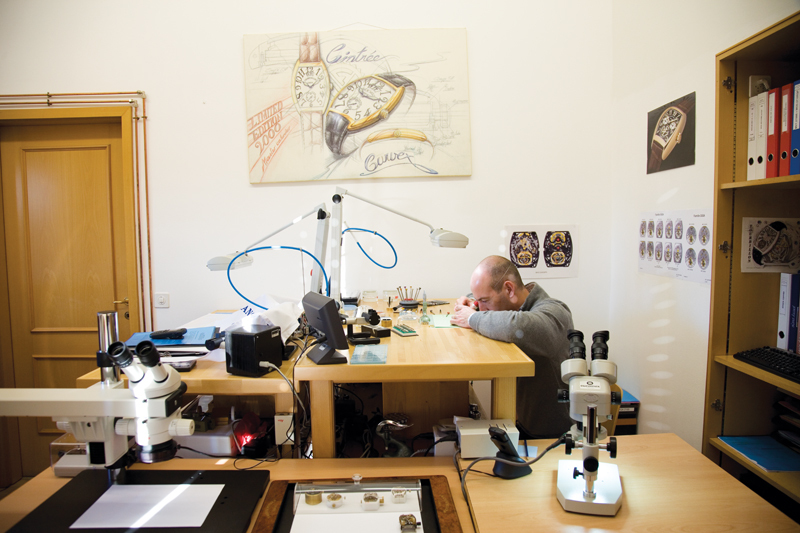 Today, who is the driving technical force at Franck Muller? 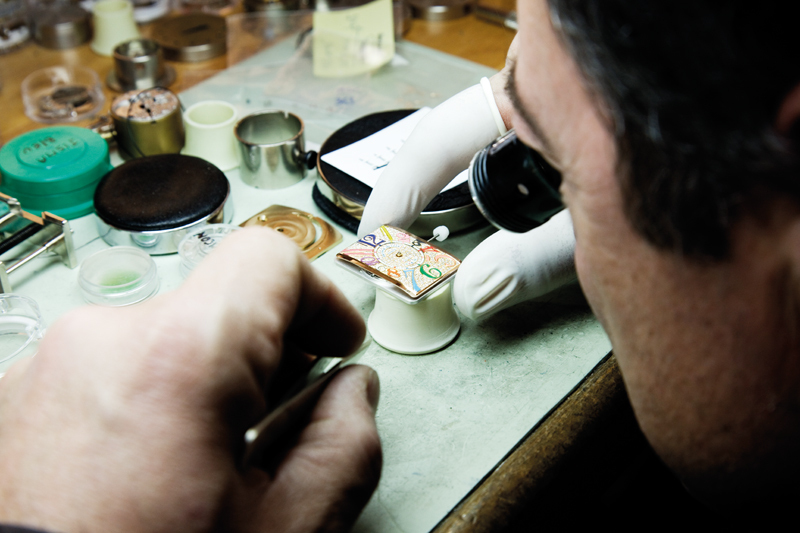 When you are watchmaking, you are in a world of passion and emotion. You are not a banker or a carmaker. You are a watchmaker, and your primary responsibility is to evoke passion in your clients. Today, I am happy to say, the technical director of Franck Muller is a man who is a master of creating emotion through watchmaking. Pierre-Michel Golay came to Watchland to help us with the creation of complications — in particular, minute repeaters. As you know, he is unrivaled in contemporary watchmaking and the master of the striking watch, as he created of all of Gérald Genta’s complications — in particular, the grande sonnerie. He is the mind behind Revolution 2 and 3, as well as the incredible Aeternitas watches. He, together with his cousin Jean-Pierre Golay, created the Giga Tourbillon, the world’s biggest tourbillon. Why is it important that Franck Muller Watchland remains one of the top innovation hotbeds in high watchmaking today? It’s very simple. When I sat down with Franck all those years ago, we set out to define who we were with one 2simple sentence. We decided on “Franck Muller: Master of Complications”. And once we established this, we could never take a step back from our innovation; we could never stop being the market leader in terms of technical innovation. Today, we are incredibly fortunate to have a team of the most brilliant minds in high watchmaking. Certainly Franck, but also Pierre-Michel Golay and Jean-Pierre Golay, who is another genius with a specialization in industrializing very complex movements. It’s like a football team. When you want to compete with the very best, you’re obliged to have some of the best talent on your team. Do you feel as if your innovations are adequately recognized by collectors and the industry? Perhaps we do not shout about what we’ve achieved as much as other brands, but examining our achievements, I think that, collectively, they represent the world’s foremost technical breakthroughs. Can you give us an example of your technical creativity? One day, when the sun was shining, I went to Franck’s house and I proposed to him that we create a brand with global distribution. I told him, “You are the master of movements, and my experience is in casemaking and industrialization — let’s do it.” At the time, looking at what was offered in the marketplace, I was sure that our watches would strike a chord, and that they would find an audience because they were totally unique. What was the first step in building this brand? I studied all of Franck’s collection and we both realized that the Cintrée Curvex was very unique. At the time, there were plenty of round watches and maybe a few rectangular ones as well, but there was nothing like Franck’s Cintrée Curvex. Also, ergonomically, it was a very enjoyable watch to wear, but also a challenging case to make correctly. So I agreed that it would be both a great way to express a unique identity and also demonstrate our know-how in cases. Interestingly, before this, Franck was known primarily for round watches. But we decided that we needed to assert a totally unique DNA. He had only made one of these watches before, for one of the richest people in Italy, but I knew we had to have this shape for ourselves. Did you, at the time, realize that you were on to something very special? I approached it from a somewhat naïve perspective, simply that what we created was beautiful and that I was sure people would recognize this. How did you get your brand known? At the time, we had cold relations with Vendôme Luxury Group, which was the precursor to the Richemont group. I had learned about the Geneva Salon International de la Haute Horlogerie and I asked Mr Alain Dominique Perrin, who I feel is one of the great visionaries of the watch world, if it might be possible to show our watches there. He agreed, and that’s how we first gained exposure to the word. What are the fundamentals of building a brand? So the challenge we faced was how to transform a small-volume product into a brand. How do you do this? You need three things. First, you must create an incredible watch that is totally unique in the world. Second, you must have a great story, and it must be a true story, not a marketing story. Third, you must be realistically grounded in the world of business. You cannot overspend, and when you make money, you must reinvest it in yourself to make your brand stronger. You need, basically, to manage and balance the creative aspect of the brand and the financial aspect of the brand. But if you have these two components, then you can go far, even if you are starting from scratch. But you must have these two components — one cannot exist without the other. One other thing that came to light during our global visits to spread the news about Franck Muller was that Franck was a natural-born communicator. This provided a big emotional anchor and communication platform for us. Were you an immediate hit? At the time, we didn’t think in terms of whether we would become a global hit or not. We took things day by day. I remember that with our first collection, my preoccupation was to make sure that people learned about these unique watches and, of course, that we sold our entire collection. This was something very new to us. We had to make the watches, we had to build the watch booth, we had to meet the clients — this was what we were concerned about, rather than “would we become a big name”. It’s funny in retrospect, but this was absolutely true. You were considered to be a breath of fresh air for the watch industry, correct? During this period, the common perception of high watchmaking and collectors of haute horlogerie was that it was for older people. There was a feeling that the watch industry was packed in mothballs, which means that it was backward looking. To Franck and me, it made sense that you would not be able to engage and attract the new generation if you continued like this. So it became our ambition to create watches that, while as refined as anything made by the big established houses, were also a bit daring and provocative. That’s why, for our first watches, as a provocation, we made these striking deep-blue dials which, at the time, was something shocking. Combined with the Cintrée Curvex cases and our Art Deco style, these were watches that no one had seen before. These did incredibly well for us. Was it difficult as a small, independent brand back then? At the time, you had only the very established names. But then Daniel Roth came into the market with a new shape and a new energy and people responded. So I knew people were hungry for innovative watches. But when we decided to start Franck Muller, I thought that not only should the watches have this unique shape and identity, but they must be complicated and must create a certain visual depth both on the dial and movement side so that you felt you were drawn into the watch. At the time, another successful brand that was reintroducing complications to the vocabulary of wristwatches was Blancpain. When I studied Franck’s watches, I saw that he had the potential to go even further than anyone else in this field because of his innovativeness. How did your reputation grow? There were two niche markets which were instrumental in establishing our brand. The first was Italy, and the second was Japan. Already, Franck, as a watchmaker, was known in those countries. So once we launched our brand, these two countries immediately connected with what we were doing. Then, during that first SIHH show, we experienced a great deal of interest from Singapore and Hong Kong. So we started in Singapore with Sincere Watch and Tay Liam Wee, and in Hong Kong with Alan Mao. After this, the other countries came. But these four countries really drove our business and established our reputation. I think it is no coincidence that in terms of global tastemakers, these countries have always been world leaders. What advantage did your in-house capacity afford you? When we started the business, there were very few truly integrated in-house manufactures. I always felt that a fast reaction time was one of the key benefits to being a manufacture. This allowed us, even early on, to have more flexibility than other brands. For example, one client would want a brushed case, while another might want a polished case. 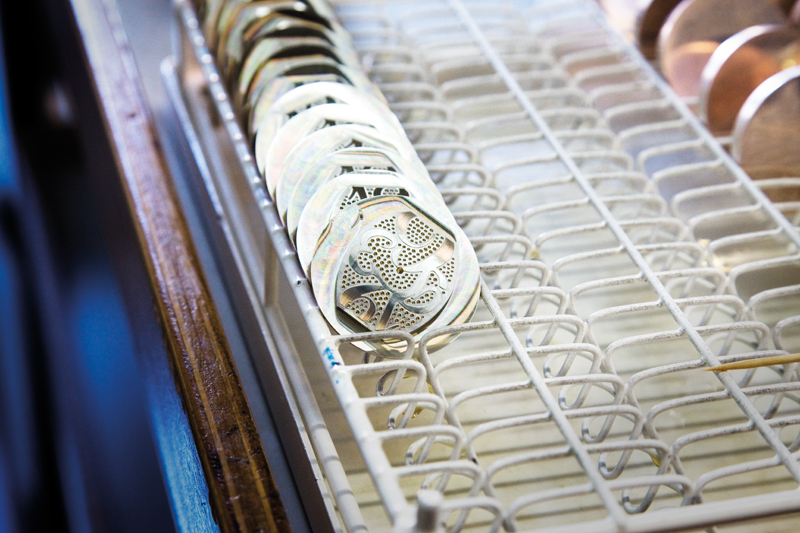 And because our casemaking was in-house, we could accommodate any request. 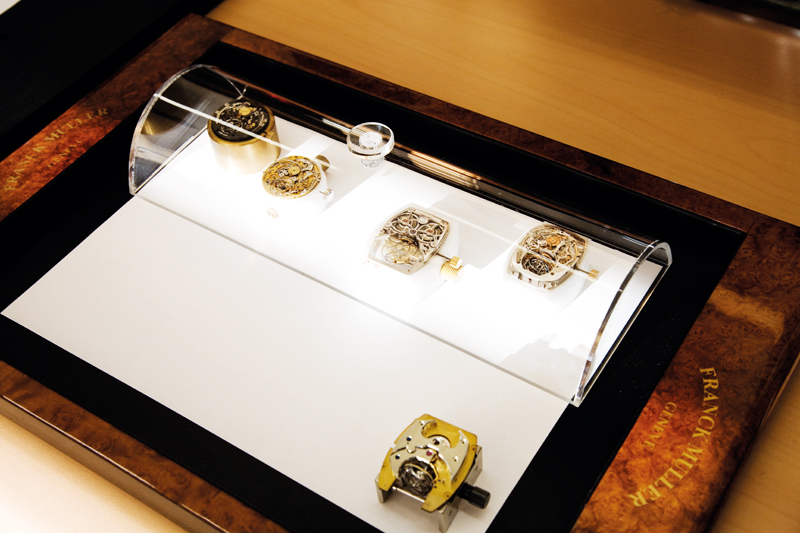 This also allowed the end clients to feel as if they could have a more personalized watch. What does the future hold for Franck Muller? When we created Franck Muller, there was no Russian market and there was no Chinese market. The world has changed so much, and we need to continue to grow with it. But the best way to grow is legitimately, through technical innovation and a reputation for the best quality and a unique vision. China, for me, is very important. I am sure that the Chinese will appreciate our values — in particular, our technical legitimacy. China is a country with such an ancient culture, with a taste for luxury that is unparalleled, and a capacity for discerning the finest. And so I think Franck Muller’s potential is just starting to be realized there. But we still have a long way to go. Fortunately, we have excellent partners dedicated to expressing our values in the right way.